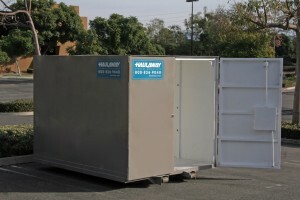 If you’re on the lookout for a shipping container in the Los Angeles area, Haulaway Storage Containers is the perfect choice! Our services allow you to rent a cargo container according to your specific needs, whether you’re moving, renovating, or just need somewhere to keep your construction storage in an organized fashion. The strong, quality-made steel Conex containers will effectively protect your items from dust, moisture, and sun damage, and allow you to complete your project knowing that your storage is safe. Start planning with Haulaway today! The way we work is simple: you contact us and let us know exactly what type of shipping container you need in Los Angeles. We offer a wide range of sizes and configurations to suit your standards and allow you to rent the cargo container of your choice, for as long as you need. Once you’ve chosen your storage container, we will deliver it to you on-site and place it according to your exact specifications. We allow you to pack the roll-off container to your preference, and will pick it up for shipping whenever you require. We are available for any level of project, large to small, and will happily provide you with as much or as little storage space as you may need. We have an incredible customer service team at the ready to answer any question you may have and help you execute your storing and shipping plans with as much ease as possible. Let our team at Haulaway Storage Containers do the heavy lifting and let you concentrate on the rest of your plans. You can contact us via our website (www.haulaway.com) or the telephone, at the toll-free number of 800-826-9040.